In the spirit of eating and sourcing local—Food Corps seeks to recruit a homegrown service member to work with Ventura Unified School District (VUSD) for the 2015-2016 school year. Food Corps is a nationwide team of AmeriCorps leaders who connect kids to real food and help them grow up healthy. Food Corps recruits, train and are placed into limited-resource schools for a year of service implementing a three-ingredient recipe for healthy kids. Currently, VUSD and Food Corps collaborate in the HAREC 4-H Student Farm, an afterschool program that teaches middle school youth to grow food that is then used in the cafeteria. To learn more about the opportunities with Food Corps at VUSD contact Alise Echele, Healthy Schools Project Coordinator at alise.echele@venturausd.org or apply for a Food Corps position at www.foodcorps.org. Ventura Unified Balboa Middle School student farmers have much to be proud of and celebrate on Friday, May 23. Led by Food Corps service member, Chris Massa, the half-acre farm at HAREC flourished. While most teens would prefer to hang out with friends on a Friday afterschool, these eager learners rode a bus to the farm. They laid irrigation, planted, weeded, harvested and donated food over 800 pounds of cilantro, chard, spinach and radishes. The produce went to the school district's farm to school program and FoodShare food bank. Weekly topics such as sustainability, seasonality, water and pest management, soils and cooking rounded out the hands-on experiences on the land. 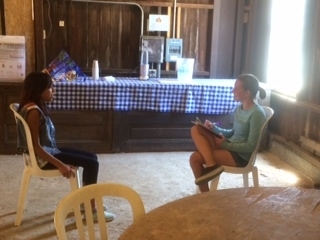 To prepare for the media, students participated in mock interviews last week. 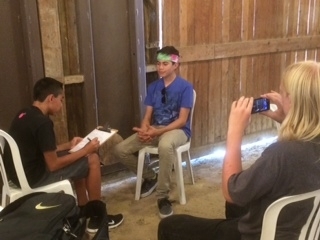 In groups of three, they took turns being interviewed, playing journalist, and videographer. The result is an insight into the learning that occurred over the past five months. The following are selected answers to the interview questions. Why did join the Student Farm? "It seemed interesting and will help in the future"
"I wanted to learn how to grow plants"
"I wanted to learn about agriculture"
Did you learn something new during your months of participation? "Yes, that when the cilantro plant is about to die they let go of seeds"
"I learned that bees make honey"
"I learned that bees are disappearing"
"I learned that different plants grow at different times"
"I learned to appreciate nature and what it gives"
"It helped me to eat healthier"
"Growing food that you can eat"
"Eating the food we grew"
"Cooking and eating the food we grew"
"Picking weeds and the stuff we grew"
Do you have a better understanding of farming or agriculture as a result of Student Farm? "Yes, it is hard work just to have every day healthy food"
Would you recommend participating in Student Farm to a friend? "Yes, because it shows you how to grow food and so you don't have to get it from the store all the time"
"Yes, because its really fun and you learn about plants even though its on a Friday and you could do other things"